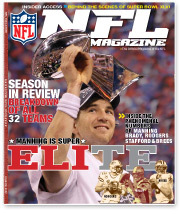 Subscribe to The NFL Magazine Today! The ultimate press pass for the NFL fan. Got 10 seconds for the NFL? Read a tweet. Sign up to receive the new NFL Magazine, the official monthly magazine of the National Football League. Go deep with your favorite teams and players, and get the real insider story. NFL Magazine features on-and-off the field coverage, providing fans insight into players and teams that can only be delivered by the official magazine of the NFL. In each issue, NFL experts and top sports journalists will offer an inside-the-huddle perspective and exclusive insights, analysis, and features from NFL Network and NFL.com. *Savings based on two-year annual newsstand cost before applicable taxes. Enter your email below and be notified of upcomming promotions and contests.